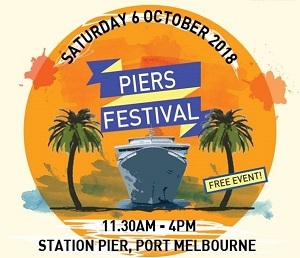 Multicultural Arts Victoria presents the 2018 Piers Festival, a celebration of the Station and Princes Pier’s pivotal role as a historic gateway to our diverse cultures and a symbol of Victoria’s growth and identity today. This year’s program embraces an ethos of collaboration: highlighting incredible cultural tradition, friendship and artistic expression. This year’s festival will be based at the iconic Station Pier and will host a global feast of activity and entertainment. •	and Spanish gypsy meets Afro-Cuban band, Karavana Flamenca, complete with dueling flamenco guitars. •	Community craft workshops, tarantella dancing, cultural stalls, delicious food plus much more. For more information head to the Multicultural Arts Victoria website here. This is a free event.